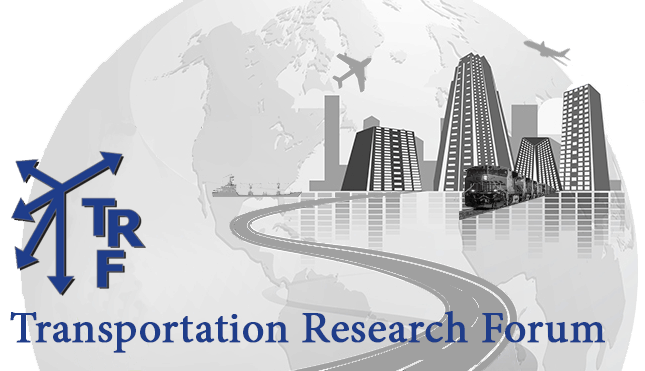 The Transportation Research Forum (TRF) is an independent organization of transportation professionals. Its purpose is to provide an impartial meeting ground for carriers, shippers, government officials, consultants, university researchers, suppliers, and others seeking an exchange of information and ideas related to both passenger and freight transportation. The Forum provides pertinent and timely information to those who conduct research and those who use and benefit from research. The exchange of information and ideas is accomplished through international, national, and local TRF meetings and by publication of professional papers related to numerous transportation topics. To review the bylaws of the Transportation Research Forum, click here. In addition to monthly meetings of the local chapters, a national meeting (an Annual Forum) has been held every year since TRF’s first meeting in 1960. Annual meetings generally last three days with 25 to 35 sessions. They are held in various locations in the United States and Canada, usually in the Spring. The Canadian TRF also holds an annual meeting usually in the spring. For more information visit the Annual Forum section. Members are addressed by prominent speakers from government, industry, and academia. Speakers typically summarize (not read) their papers, then discuss the principal points with the members. Members are encouraged to participate actively in any session; sufficient time is allotted for discussion of each paper. Some sessions are organized as debates or panel discussions.